Size Doesn't Matter: Why Small Business Is Big Business - Profit Now from the Small Business Boom! Are you ready to profit now from the small business boom? 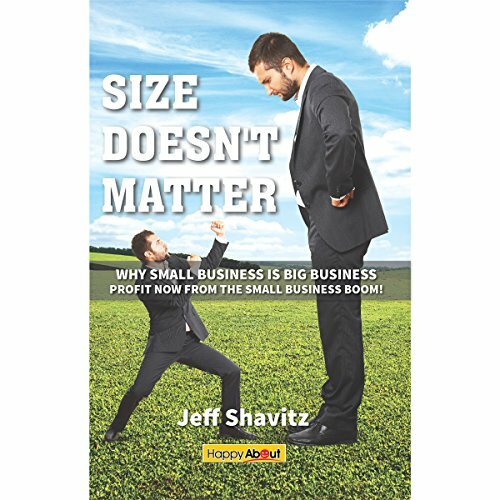 In Size Doesn't Matter: Why Small Business Is Big Business, serial entrepreneur Jeff Shavitz encourages you to do so - but only if you're cut out for it. To help you make the leap (and to succeed once you do), Jeff details his personal and professional experiences, observations, challenges, and rewards in operating small businesses. After paying his corporate dues as an investment banker at Lehman Brothers in the 80s, Jeff started and sold three companies, making him an expert with real-life experience on entrepreneurship. Now, it's his passion to help his fellow small business owners navigate their careers through the turbulent and exciting times that come along with the much-coveted position of being the one in charge...of everything. From successfully growing your business from start-up to enjoying the benefits of being cash-flow positive to ultimately planning your exit strategy, Jeff shares his advice with insight, empathy, and a healthy dose of humility. Size Doesn't Matter will be your coach and confidant as you reflect upon your own journey in the world of small business. Learn from Jeff, relate to him, feel for him, and laugh with and at him, as you enjoy and benefit from his words of wisdom. View More In New Business Enterprises. If you have any questions about this product by THiNKaha, contact us by completing and submitting the form below. If you are looking for a specif part number, please include it with your message.